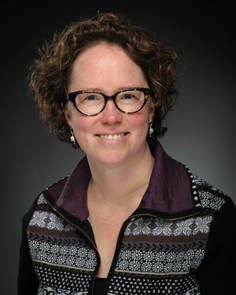 FARMINGTON - Kathryn Will-Dubyak, University of Maine at Farmington literacy education professor, has been named a 2018 Bonnie Campbell Hill National Literacy Leader Award winner by the Children’s Literature Assembly at the National Council of Teacher Educators national conference in Houston, Texas. This professional recognition includes a $2,500 grant and is given annually, in memory of educator Bonnie Campbell Hill, to each of two educators dedicated to improving the teaching and learning of reading and writing in grades K-8. Will-Dubyak, an assistant professor of literacy in the UMF Division of Elementary, Early Childhood and Early Childhood Special Education, works primarily with pre-service teachers to help them develop the professional skills needed to assist K-8 students struggling to improve their reading and writing skills. Will-Dubyak used part of her grant to provide a professional development opportunity for two of her students—Allicia Hilton, senior from Skowhegan, and Emily Hartford, senior from Turner—who accompanied her to the national conference. The conference experience helps promote a wide range of professional objectives including, advancing subject matter expertise, extending knowledge of resources, developing new skills and extending professional contacts. Will-Dubyak teaches literacy coursework in the elementary education program. She taught in a four-room school house in Montana, developed preschool summer camps and family-to-farm camps before transitioning to teacher preparation. Prior to joining UMF, she worked at Montana State University where she developed a passion for embedded teacher preparation. Her research interests include the development of teacher efficacy through embedded teacher education models, rural education, and the role of non-cognitive attributes in teaching and learning. Congratulations Professor. Well-deserved, I'm sure. You go Kathryn! Congratulations on this award! Congratulations, Kathryn! Recognition of one's peers is indeed a BIG honor. Congratulations to an inspiring educator.